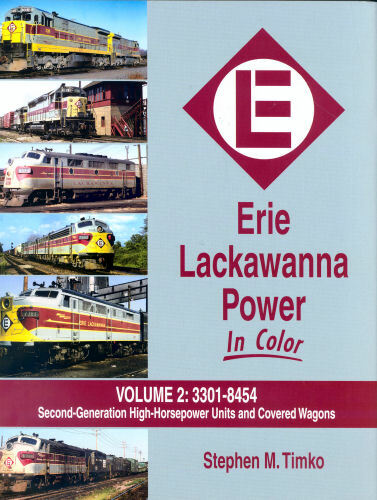 Erie Lackawanna Power in Color, Volume 2: #3301-8454 - ﻿Former EL employee Timko completes the coverage of this railfan favorite road starting with U33C #3301 and ending with former passenger-equipped F3A #8454. Coverage includes the U36C and the New Jersey-owned U34CH units, EMD SD45, SDP45 and SD45-2�s. Completing the coverage of this fallen flag are the FT�s, F3�s and F7�s, as well as the Alco 1500 and 1600 horsepower A�s and B�s. Hard cover.